After a late breakfast, we’d continued a short distance on the river and disembarked. Land Rovers brought us into Chitwan and our safari camp, which consisted of somewhat primitive huts surrounded by a wall of some satanic thorn growth that looked truly formidable. Everyone seemed to vanish into this camp; as though no one wished to talk to anyone at this point in the journey. Or perhaps we were all just tired. It was a quiet refuge and a blessing .. I spent the afternoon soaking up the silence. Staff at the camp seemed invisible except when manifest at meal times. I slept soundly under mosquito netting covering my bed, just like some sahib in a B quality adventure movie. Recalling John Lennon’s ‘Bungalow Bill’, our crew who’d been checking out all sorts of Hindu religious experience would, tomorrow, take an elephant ride to check out the park, albeit sans firearms. Following coffee and late breakfast, the Tibetan & myself managed to avoid whatever morning activity it was the others had run off to experience. It was before noon yet, when a young French couple had been dropped off, and no one from staff was there to greet them. They’d accosted me and I’d told them someone would make an appearance, just to be patient. In the meantime, they decided to have a walk out into the surrounding forest on their own. I told them this was definitely NOT a good idea but with typical French superiority -a roll of the eyes & wave of the hand- they dismissed my advice and wandered off on foot, out the gate and beyond the thorn walls. After, someone from staff made an appearance; there was an elephant ready for the Tibetan and myself. Now, I’d never ridden an elephant, this was the stuff of Tarzan and Hannibal in my preconceived notions. But here I was, climbing a short stair onto a platform and stepping onto a flat wicker saddle on an elephant’s back. It seemed more of a cargo platform than a passenger seat, as there was no rail, just a sturdy flat surface of woven sticks with some thin cushion strapped on. The mahout was in front of, and lower to us, astride the elephant’s short neck, behind the head. Riding the wicker platform was ok, you soon realized the elephant’s gait was at most, a mild sense of a ship at sea. The Tibetan could understand the mahout’s language and they were conversing. One of the mahout’s statements was, “This is a really good elephant, I’ve had him for seven years and he’s never freaked out.” I pondered that, as I watched him dig his big toes into the elephant’s ears, prodding & pushing inside the lobes, while time to time tapping the large creature’s head with a stick. ‘Please, just make one more trip without freaking out’, was was my thought. A half hour ride through the forest brought us to an open area of tall reed-like grass and we were pushing forward through this, when suddenly we were among rhinoceros. We were able to get alongside these large animals that were dwarfed by the creature whose back we were on, if I’d had the mahout’s stick, I could have bent down and touched one, we came that close. The rhinoceros were not in the least disturbed by the presence of the elephant, with no natural sense of enemies between them. It was really quite amazing. After awhile among the rhinoceros, and a bit more sight-seeing from ‘elephant-back’, we headed back into the forest, returning to our safari camp. The Tibetan’s sharp eye spotted a brown cobra, slithering across the forest floor, apparently cobras get out of the way of elephants, not vice-versa. Then, from over 100 meters distance, we saw the French couple waving from high in a tree .. HALLOOO!! .. they were calling out as loudly as possible. I nonchalantly waved back at these intrepid souls, as though in passing at persons calling out from the far side of the River Styx. The Tibetan and myself briefly speculated at which creature they might have encountered and the mahout did not deviate from our trail. Funny thing is, I don’t recall seeing them again; perhaps they were rescued by the Foreign Legion, with brass anthem and medals all around. 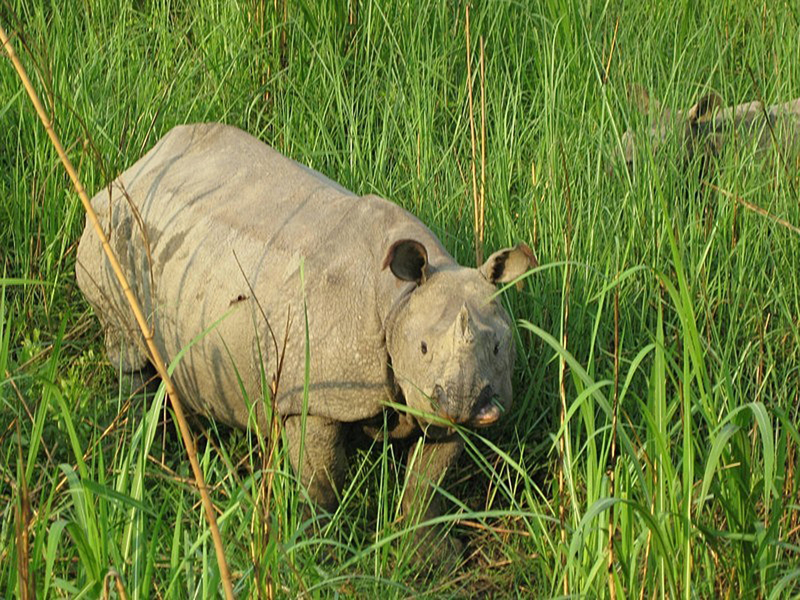 In Kaziranga in India rhinos not infrequently charge elephants – but usually break off the charge at some point before impact.